It’s often said that Australians are a nation of travellers. One could stretch to almost any corner of the globe and stumble across an Aussie. Given the increasingly global context of business and economics, we would suggest that the intrepid nature present in individual Australian travellers is increasingly prevalent in some of our nation’s best emerging companies. This creates significant opportunities for the more enterprising Australian investor seeking select exposure to offshore markets and associated growth thematics. Without necessarily investing via offshore exchanges such as the NYSE or the major European bourses, domestic investors can still access global growth opportunities that encompass varying geographic and sector specific exposures. While not only adding a degree of portfolio diversity, such a strategy also acts to provide access to significantly larger markets and therefore potentially substantial long-term growth runways. With the above noted, offshore growth strategies are not without pitfalls. Australian corporate history is littered with stories of ambitious offshore growth plans that failed to gain traction and ultimately ended up in the destruction of shareholder capital. In today’s analyst piece, we highlight a handful of ASX listed smaller companies that we believe are well positioned to continue executing on their own global growth strategies. BVS is a market leading global provider of enterprise software and software-as-a-service (SaaS) to the wealth management and funds administration industries. Established in 2004 and first listed on the ASX in 2006, BVS has grown to become a world class supplier of software and associated professional services to some of the world’s largest superannuation, pension, life insurance, investment, private wealth and funds administration entities. 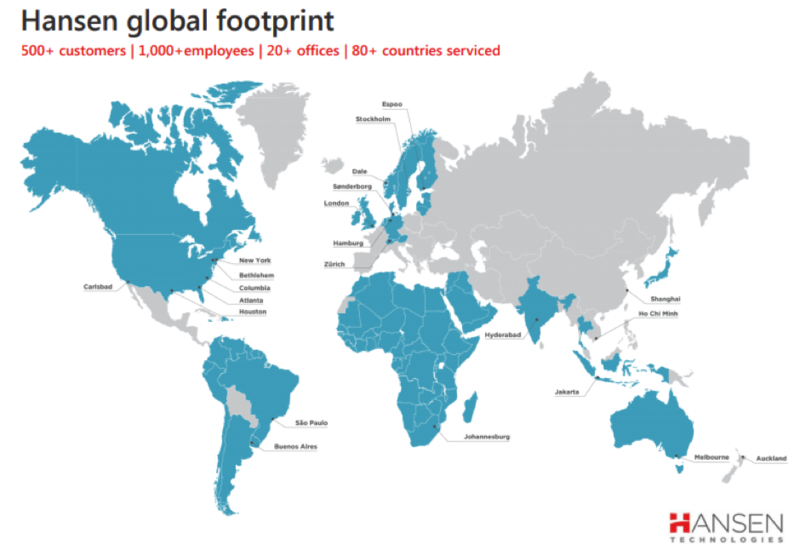 Bravura has 12 offices throughout eight countries in Asia Pacific (APAC) and Europe, the Middle East and Africa (EMEA). Bravura operates development and support centres within eight of these offices in the United Kingdom, Poland, India, Australia, New Zealand and South Africa. We believe the investment thesis for BVS stacks up well within our investment framework. Our analysis suggests that the company’s core software product, Sonata, is gaining market share in a growing market. Sonata is the result of in excess of $100m of product development and investment that now has it best positioned to capture a significant market opportunity. This sees BVS largely replacing ageing legacy systems that are no longer fit-for-purpose. This is becoming increasingly evident across its core geographical markets of the United Kingdom, Australia, New Zealand and South Africa. As it stands, BVS already generates about two thirds of its revenue in offshore jurisdictions, most notably the UK. We see this portion of revenue growing in future years, with most new contract wins in recent times coming from the UK and South African markets. Among many things, we are attracted to Bravura’s high degree of revenue visibility. This is due to the lengthy nature of its contracted client base, which typically spans 5 to 10 years. We also believe the business is well placed to drive significant margin expansion over time, particularly as the roll out and implementation of Sonata gathers pace. To provide some further context around this, we believe it is useful to track the average revenue per Sonata client over time. As at FY2013, BVS had three Sonata clients producing an average annual revenue per client of $1.7m. In FY2017, Sonata clients numbered 20 while average revenue per client has nearly tripled to $4.6m. We expect BVS to add between 3 to 5 new clients per annum for the foreseeable future, while revenue per client is expected to trend towards a range of $5m to $6m per annum. As (higher margin) annual license revenue becomes a greater share of the total group revenue, we also believe current EBITDA margins of ~17% will migrate towards a range of 20% to 25%, over the medium to long-term. A common feature that BVS shares with many other Clime Smaller Company Fund constituents is that it has a net cash balance sheet, which when coupled with sound cash generation, affords management considerable scope to both reinvest in the business while concurrently paying out a good level of bi-annual dividend income. In line with this view, management have provided earnings guidance that equates to per share earnings growth of approximately 15% for FY2018, while the forecast dividend yield approximates 5.5% p.a. While we are notably positive about the prospects of BVS, we are also cognisant of the risks associated with the investment. Given the geographical spread of the business operations, currency risk will be omnipresent. Therefore, an appreciating AUD would act to temper earnings growth (which was the case in FY2017) and vice-versa. The AUD-GBP exchange rate is currently the most significant currency exposure for BVS. Given BVS operates in the software and services sector, risk of technological change may adversely impact the operations of BVS in coming years. The client base of BVS are also concentrated in the financial services sector, the operating conditions of which would obviously be impacted in the event of any material economic slowdown. 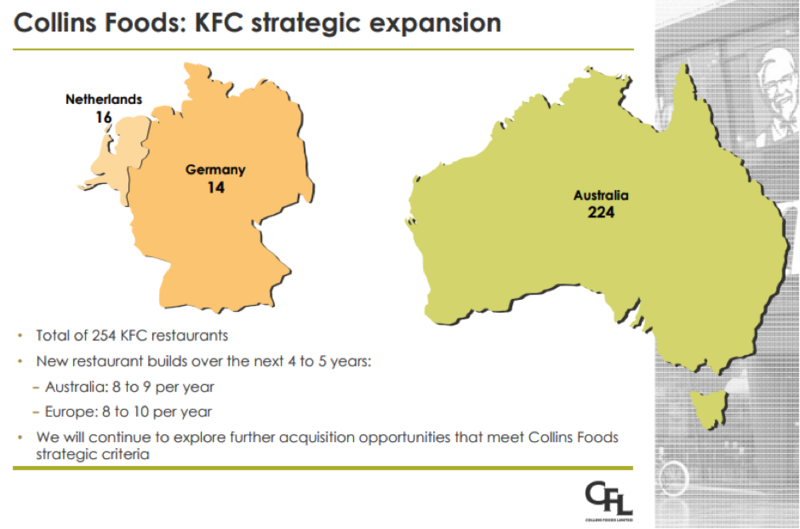 The core business of CKF relates to the operation, management and administration of KFC restaurants across Australia, Germany and the Netherlands. Though only listed on the ASX since 2011, Collins has been around since the 1960s, having obtained its first KFC franchise in 1968. In the decades since, CKF has steadily grown its footprint and is now one of the more prominent KFC focused franchise operators in the Australian market (at around 30% KFC network share). Today, CKF’s KFC store network totals 254, with 224 restaurants in the Australian market and 30 in the Western European markets of Germany and Holland. 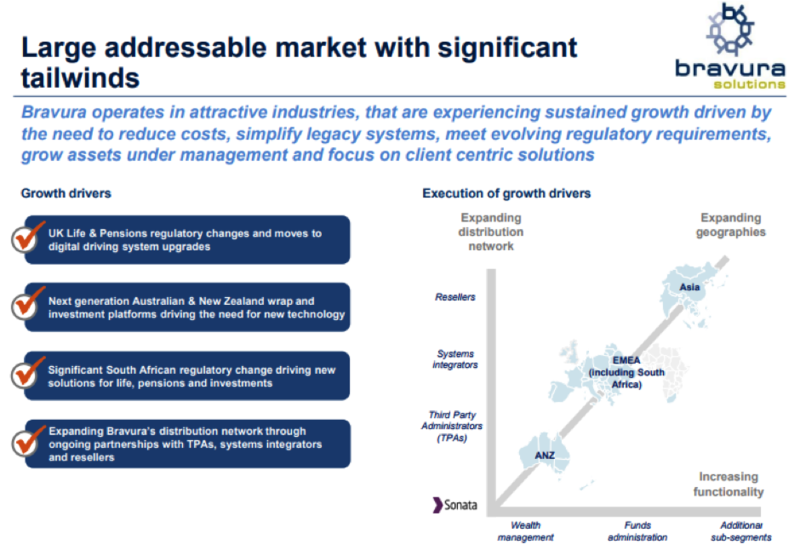 CKF’s Australian network, while still growing, is relatively more mature and forms the backbone of cash generation for the company. Looking ahead, our thesis primarily relates to the opportunity for the business to reinvest its substantial cash flow into organically growing the store network in the underpenetrated Western European markets. To that end, management have indicated that they expect to roll out approximately 16 to 19 greenfield sites across all core geographies annually. This equates to organic footprint growth of about 7% per annum. When coupled with moderate growth in same store sales and likely incremental scale benefits, we believe CKF can generate double-digit earnings growth over the medium-term. While much remains to be executed, given a sound track record, experienced management and a strong existing foundation, we believe CKF can become a much larger business in the years to come. NGI is a company that we have highlighted over the past 12 to 18 months given its value appeal and improving operational momentum. To recap, NGI is the parent company of Lighthouse Investment Partners, a US-based global absolute return hedge fund manager. Lighthouse manages US$10.0bn across commingled funds and customised accounts for endowments, foundations, institutions, pension funds and large individual investors. NGI is somewhat unique in that all revenue is generated offshore in its core US market, with its ASX listing effectively a legacy borne out of corporate activity several years ago. In 2007, at the peak of the market, the then Australian focused HFA business bought Lighthouse for just shy of $750m in cash and scrip. Since that time, Lighthouse’s business has continued to steadily grow while the Australian operations have been wound down. After a long road to recovery, the company has emerged as a genuine growth story. With resurgent growth in assets under management, up 19% to US$10.0bn over the past 15 months, coupled with a strong cashed up balance sheet and consistency in cash flow, we believe the company is well placed to invest for future growth. Now trading slightly beyond $3 per share (~$500m market capitalisation), and having paid a healthy dividend along the way, NGI has been a strong performer over the past 12 months. After a solid run, the question of course is whether it’s time to assess our portfolio weighting. In our view, although NGI is no longer extremely cheap, it is certainly not expensive. Given the company still trades on an attractive and growing free cash flow yield of around 8.0% (9.2% on a forecast ex-cash basis), which supports a 7%+ dividend yield, we remain positive on the company’s near-term outlook. Perhaps more importantly, we also remain positive on the company’s longer-term prospects. Based on discussions with management, NGI looks to have a strong pipeline for more customised mandate wins in new distribution markets in the Middle East, Japan and Europe. NGI is a USD reporter and therefore enjoys a translational benefit as the AUD depreciates against the USD. HSN’s growing global footprint is impressive and encompasses a large, diversified client base of nearly 600, spread across 80+ countries and serviced by 20 offices in various geographical locations. As illustrated below, HSN has a diversified exposure to various currencies. 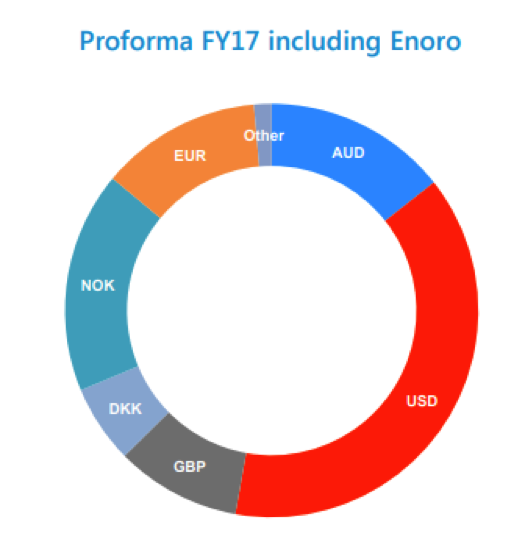 While the somewhat stronger AUD in FY17 was a mild headwind for the company in that financial year, should recent AUD weakness continue, this trend will likely benefit reported results for FY18. Looking ahead, we believe the company is well placed to deliver double-digit growth in per share earnings and cash flow over the next two to three years. If achieved, this will build on the strong track record of growth, largely self-funded, delivered over the past decade. Clime Asset Management owns shares in HSN, HFA, CKF and BVS on or behalf of various mandates for which it acts as investment manager.